This is simply a spectacular trilobite. It is an extremely spiny Ceratarges spinosus from the Devonian of Morocco. This remarkable bug has been meticulously prepared in the EXTINCTIONS Prep Lab here in Colorado, as are all of our Moroccan trilobites. 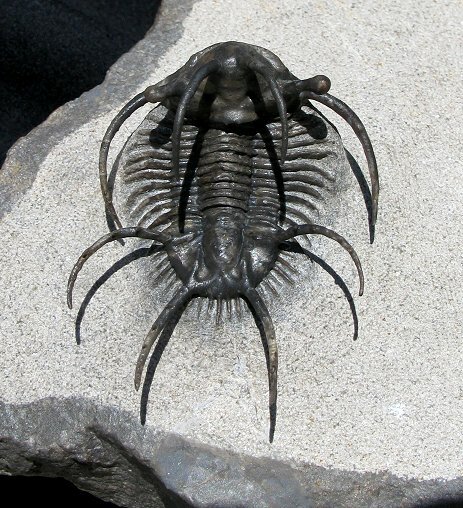 This 3-dimensional trilobite is very well preserved and exhibits outstanding detail. The bug has a pair of long, arching ''horn'' spines and long genal spines - ALL of these spines have been prepared in a free-standing manner. The large eyes are borne on the ends of long stalks - these have also been prepared free of matrix. But wait, there's more! All four tailspines have a series of spines growing on the long spines! This is a very uncommon feature in trilobite morphology. This bug displays these ''thorns'' beautifully on the long, free-standing tailspines. And with the trilobite this well articulated, this is one of the best Ceratarges spinosus ever prepared! This is a fabulous example of this extremely spinose trilobite - simply a centerpiece specimen.